Have a fun filled, exciting day with friends, family or corporate groups at Peacock Sky for team building or just good old fashioned fun! Have a fun filled, exciting day with friends, family or corporate groups at Peacock Sky for team building or just good old fashioned fun! Learn how to handle an authentic replica firearm (airsoft) in a safe learning environment, practice for a while, then test your skills against the clock. Full instruction and safety gear will be provided for all participants. Flat, comfortable and enclosed shoes are necessary. 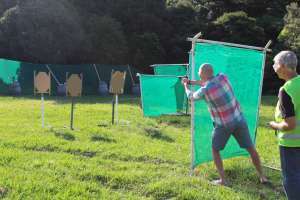 Re-live the fun of an old-school fairground shooting gallery, with a variety of knock down targets. Depending on the size of the group and activity level we can make this event a static challenge focused on accuracy (also suitable for disabled guests), or we can incorporate movement to add an additional challenge. This activity is suitable for all ages. For more advanced groups we can offer full movement IPSC style courses of fire including moving targets, different shooting positions, use of cover, strong hand / weak hand drills, obstacles including barricades and doors, fully scored and timed against the clock. We can set up a wide range of tactical scenarios including themes like “Hostage Rescue”, “Ambush”, “Saloon Shoot Out”, etc. Call us to discuss available options and any special requests your group may have. This activity is more suited to advanced players and graduates of our Carnival Mode activity. It may involve assuming kneeling or prone positions and movement across uneven terrain. Suitable footwear is required. 11-30 people $30pp Approx. 75-120 min. After your activity, you can dine and have a glass of wine! For all Action Pistol shooting, BOOKINGS ARE MANDATORY!